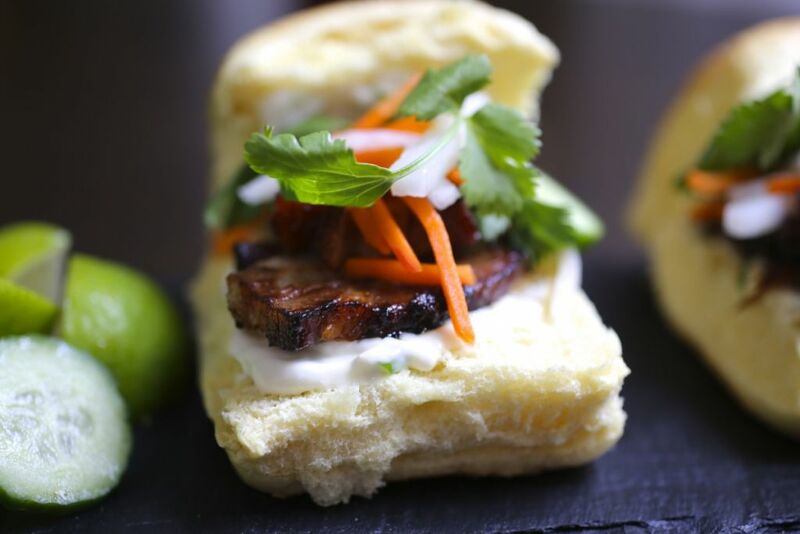 What to do with leftover pork belly: Make Bánh mì sliders! I’ve mentioned before that I occasionally do a very shameful thing when I buy too many vegetables. Since I’m already over-sharing, I might as well admit to another terrible habit. I really enjoy cooking for dinner parties and family get-togethers, but way too often I’ll wrap whatever protein is left over in foil and throw it in the freezer where it will stay for months, gathering frost and becoming less appetizing by the hour (I’m looking at you Easter ham). I know, I know. There are so many great things to make with leftovers. Soups, stews, salads, casseroles, and honestly I do make these things but the sad truth is the thrill is usually gone and I’m doing it to not be wasteful, as opposed to being actually inspired. So you can see why I was nervous as I wrapped the remains of the Crispy Pork Belly with Soy Honey Glaze in its foil coffin (I’m feeling dramatic today) and tossed it in the freezer. “You were so good”, I said to it mournfully, “but it’s been two nights and I’m ready for a salad”. Several weeks went by and every few days I would guiltily toss the little frozen pork belly package to the side as I looked for dinner options. 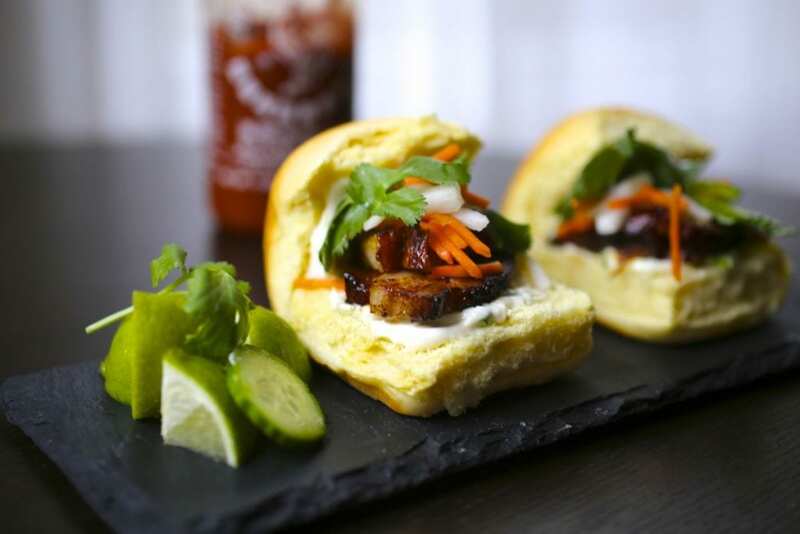 Then it hit me; Pork belly Bánh mì sliders. As it happens, we were going to have a few friends over for a Halloween/birthday get-together and it would be nice to have something a bit more substantial than dips. Turns out they were good. Like, really good. This is now officially my favorite use of pork belly. The sweet, vinegary pickled carrots and daikon really cut through the richness of the pork. The crisp cucumber and bright cilantro make it light and fresh. 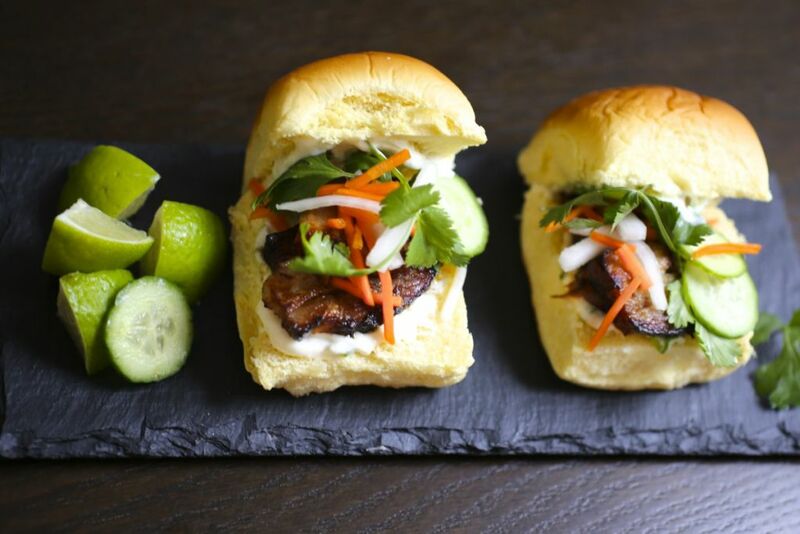 Seriously, not kidding, make the pork belly just so you can make these sliders. Place carrots, daikon and salt in a colander over the sink and mix together. Allow to sit for an hour, tossing together every 15 minutes. Thoroughly rinse, drain and place into a bowl. Meanwhile, place sugar, vinegar and water in a small pot and bring to a simmer. Cook for 2-3 minutes, stirring until sugar dissolves. Allow to cool for 10 minutes and then pour over carrot and daikon. Refrigerate until ready to use. Place mayonnaise, garlic, scallions, lime zest and juice into a small bowl and stir together. Spread a small amount of the mayo onto the tops and bottoms of each bun. Place a two pieces of pork belly on each bottom bun and top with some pickled daikon and carrots. Add a slice or two of cucumber and a sprig of cilantro. Add a squirt of sriracha (or your favorite hot sauce) to taste. Place tops on each slider and gently press. Devour while moaning. You could use leftover chicken, other cuts of pork or even shrimp for this. Just slice the protein thinly and give it a quick dip in a soy/honey marinade before searing in a pan. Tofu would also work very well. Press some firm tofu, slice it in 1/4″ slices, give it a quick marinade, and crisp it up in a pan. Mmmmm…they were deelish! My fave! Yay, so glad you liked them! I forgot to put out the hot sauce though! Too many Grape Gimlets, I guess. These things are absolutely decadent. First time out of the gate, served to some friends – we had to fight over the last two (I lost, being the “good” host). Little do they know I held some in reserve for my personal enjoyment. Tried adding some slivered shallots to the slaw seemed to work,. Had to drain the slaw before using. Next time may try some watercress in lieu of cilantro – just for giggles. Ha! I know it’s a sad sight when they’re all gone. Love the watercress idea. I’m going to try it next time!